FREE!!! The word that pricks up ears of not only marketers but of non-marketers as well, because who doesn’t love free stuff? There are so many memes in the world regarding women running to a shopping mall when they see something free with a product, or men rushing to the pubs when they see free pints with their ordered menu, or kids wanting something because of the free toy. But the reality is how long can we have free stuff? In the marketing world, there will be hardly any marketer who doesn’t love promoting something for free. The reality, however, is different in the marketing world. You hardly get valuable stuff in return for nothing. Even you think that a lot of brands used Facebook pages when it wasn’t strict in its algorithms’ and the business pages reach was higher, then you might be delusional. They had to adopt other ways to grow their brand. Anyhow, it’s 2017 the year when companies will start considering paid media as a critical aspect of their overall campaign strategy. This is one of the biggest challenges that nearly every brand is facing. How to extend the reach of the content post/page is creating setbacks for many brands that don’t know how to break their limited circle and find a better audience. Gone are the days when organic reach was bigger on Facebook. The company has updated its organic reach policy and has left marketers/companies/bloggers with no option other than paying to extend their reach. Since Facebook owns Instagram, it looks like meeting the same fate. The diminished post reach has given many sleepless nights to marketers. Until and unless you don’t have a good amount of followers following your brand on Facebook and Instagram and engage with your posts, your chances to have better organic reach without paying a penny will only disappoint you in the end. Hence, it has become a necessity to put some investment in the content we create. There’s no other way left to extend post reach on social media channels without slimming the wallet. Running an ad digitally needs a team of expert or a creative brain that can create ad campaign without annoying people. In a survey, respondents pointed out various reasons of getting annoyed: HD ads that slow website speed, Full page pop-up, ads placed between the content etc. Ask yourself which websites you used to love visiting, but don’t visit anymore? The reason might be the excessive placement of ads in various forms on the website, regardless of how valuable content source the site was, you decided to leave it for once and all. Many blogs have lost their huge audience base because their greed blindfolded them and they couldn’t sense the nerve of a new era. The biggest challenge for marketers is find ways to smartly use ads on their platform. The best way that has come up after years of marketing research is branded content. It’s a bit technical to do it, but you can hit the nail on the head, then the users will never ever come to know that’s not an article alone, but an ad that’s specially created to target and influence them. Everyone using the web understands the importance of getting searched. It’s the first-hand information that no marketer can ever take for granted. Most of us use Google for most search queries’ and have abandoned completely other search engines. Hence, Google has become a primary search engine for most of us, and it will cover more market share in the future. Since Google keep updating its algorithms, it’s getting tougher to get found in Google search results. The best way is to create original and valuable content and earn quality backlinks from authority sites. It’s not an overnight process and can add up months or even years to create a strong platform for the website in search engine results. 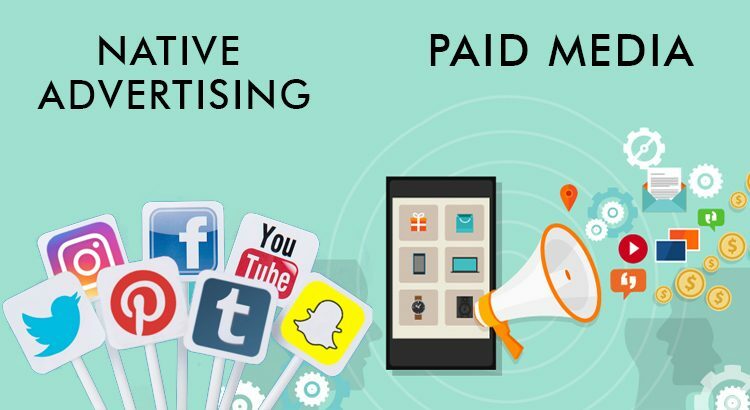 With paid media, however, your website can show up on certain key phrases that you are targeting in your Google Adwords account. However, to properly use the tool and get best ROI on every dollar spent, you have to study the market and understand the process of creating paid campaigns to bring better relevancy and fruitful results. Companies are putting a lot of money in the content creation. You can create the best content, however, getting users to enjoy it is a different aspect altogether. So, how can you let users know about your content? The best way is to publish content on different social media accounts and do some paid promotion to drive targeted traffic to your site. Without paid media, it’s truly hard to extend your content reach.